Mouflon are thought to be the primary ancestor to the majority of domestic sheep today. Some sources that I’ve read have even stated that sheep were the second animal to be domesticated, after the dog. 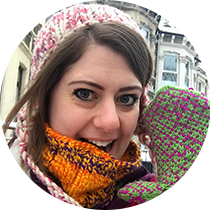 This is unverified though – the joys of writing a blog post and not a scientific paper is that I can add hearsay like that and not worry about it, hurrah!! I have spent some time looking for where I found that fact, but it is lost to the mists of time unfortunately. There is not a lot of science that has been published recently to back any of this up – as an alumnus of Imperial College, I have (limited) access to articles published after 1970, but have found few studies which can be of use on Plutonium Muffins! However, “Five Ovine Mitochondrial Lineages Identified from Sheep Breeds of the Near East” in Genetics 175 (3) p. 1371 by Meadows, Cemal, Karaca et al, published in 2007, indicates that scientists have managed to trace back to five mitochondria that originate from the mouflon in many domestic sheep. This could indicate the modern sheep are descended from pure-bred mouflon ancestors, or that early sheep cross-bred with mouflon to get these mitochondria into their DNA. There is one other sheep that could have contributed to the domestication of the animal; this species has not been identified, according to the Journal of Heredity. 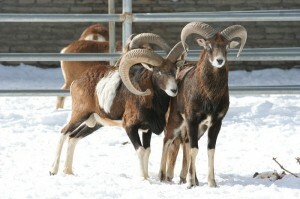 In any case, it is without dispute that the mouflon is the oldest breed of sheep currently living. The conservation status is classed as ‘vulnerable’. Mouflon live in steep mountainous woods near tree lines, and they migrate to lower altitudes in winter. They have short haired coats which are red-brown with dark back stripes and light-coloured saddle patches. Males are always horned, while females can be either horned or polled. The horns are very impressive – very big and curly, and I would not like to get in a fight with them! They are small, with large males being around 50 kg – the size of a big labrador. It is nigh on impossible to find mouflon fibre for spinning/knitting on the Internet – if I am wrong and you have some, please do get in touch. I suspect that this is because of the nature of the fleece, which is short haired and nothing at all like the fleeces we are used to. You can buy a mouflon sheep-skin if you are so inclined. Mouflon meat is a popular food in areas where they are bred for eating. 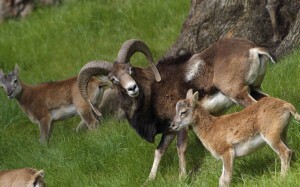 Armenian Mouflon, found in Iran, Turkey, Armenia and Azerbaijan. Some flocks also exist in Texas, having been introduced there. There are around 11,000 of these in the wild, and it has been illegal to hunt them since 1936. 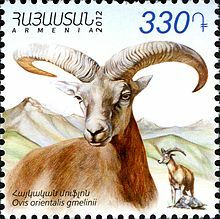 Armenian Mouflon (or Iranian Red Sheep) on a stamp. European Mouflon, introduced around 7,000 years ago in Corsica and Sardinia and now endemic to these regions. This sub-species can also be found in other parts of Europe, but is nearly extinct in Sardinia and Corsica. Cypriot Mouflon, in Cyprus with around 3,000 currently alive on the island. These are the largest animals found on the island and live in the Paphos Forest. Mouflon in Cyprus – a male and a ewe. 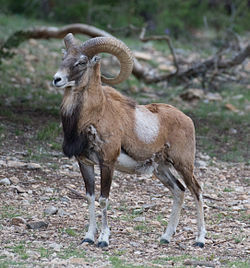 Esfahan Mouflon, found in the Zagros Mountain in Iran. 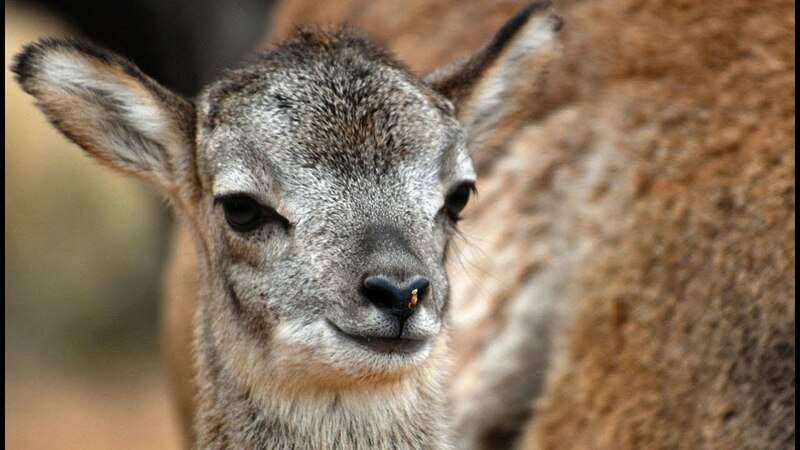 Laristan Mouflon, also Iran but found in desert reserves. 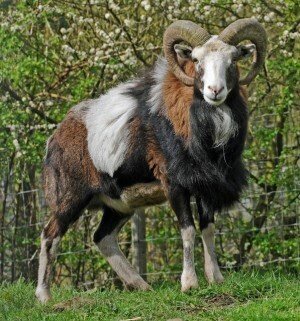 The European Mouflon is very common in a Google Image search – as a trophy hunting animal! Although this sheep is very small, the horns seem to be a great prize for hunters and there are a lot of photos of triumphant stalkers with their little catch. The breed was extinct in native Sardinia around 100 years ago, but has since been reintroduced and is now prevalent once again. Mouflon in a zoo in the USA. The Esfahan and Laristan Mouflon are very difficult to find information about – in fact, I have only managed to find scientific articles regarding the genetics of them, and webpages where you can book your own hunting trip to shoot one. Needless to say, I don’t think it is necessary to include this information – but if you have any information on the sheep, please do let me know! The mouflon breed hit the headlines in 2001, when a mouflon was successfully cloned in Sardinia using genetic material from a mouflon and a domestic sheep. 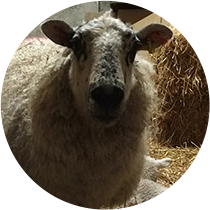 This was the first time a wild animal had been cloned using domestic eggs, and the lamb lived for at least seven months. I can’t find information on it after this age, so presumably it lived a long and happy life and was not of interest to media outlets anymore, or it died and they didn’t want to report it! A Mouflon Lamb, cutey pie! Well, that’s it for the Mighty Mouflon! They have left us with a fantastic legacy, and I am in no doubt that the domestication of these animals has changed the way that we live today – for the better. Thank you, Mouflon. I hope you found this informative – if you have any further facts for me to add, please do let me know. http://en.wikipedia.org/wiki/Mouflon accessed on Thursday 11th September 2014.
http://news.nationalgeographic.com/news/2001/10/1025_TVsheepclone.html accessed on Friday 12th September 2014.
http://en.wikipedia.org/wiki/Iranian_red_sheep accessed on Friday 12th September 2014.
http://www.aboutcyprus.org.cy/en/cyprus-moufflon accessed on Friday 12th September 2014. This entry was posted in Blog, Crafty Roots, Sheep Breeds. Bookmark the permalink. Thanks for the post, very informative. At first glance they look like goats, I wonder if they also have the down type undercoat like angora or cashmere goats? Very interesting! I love that little lamb photo. Wow, thanks for sharing this post, it was really interesting! Will have to put Mouflon on my list of fibers to search out for spinning!